His health (but never his spirit) had been failing in recent years, including the introduction of oxygen tanks to assist with respiratory issues. He’s said for years that he needed new lungs. But with two different ambulance visits to the hospital over the past couple of weeks, what had been theorized as pneumonia ended up being an aggressive stage four colon cancer. From 1964 to the early 1970s, William Hawkins was a considerable presence in Ottawa, from publishing poetry, composing songs for the band The Children (which included a young Bruce Cockburn) [and only released their first album a couple of years back], and organizing events at the infamous coffeehouse, Le Hibou, hosting poets, musicians and writers alike, including Leonard Cohen, Gordon Lightfoot, John Robert Columbo and Michael Ondaatje. He won an award from the Mayor, and pissed off as many people as he encouraged and influenced. As he explained in a 2008 interview: “I just dropped out sometime in 1971, when I woke up in the Donwood Clinic, a rehab centre in Toronto, with no idea how I got there, weighing 128 lbs and looking like a ghost in my six-foot frame.” His last book for quite some time, The Madman’s War, appeared in 1974, but for the most part, he quietly retreated from public life to drive a cab for Blue Line, where stories of seeing Bill became as rich and plentiful as tales of the Loch Ness Monster [Read an interview from around that time with Hawkins, here]. 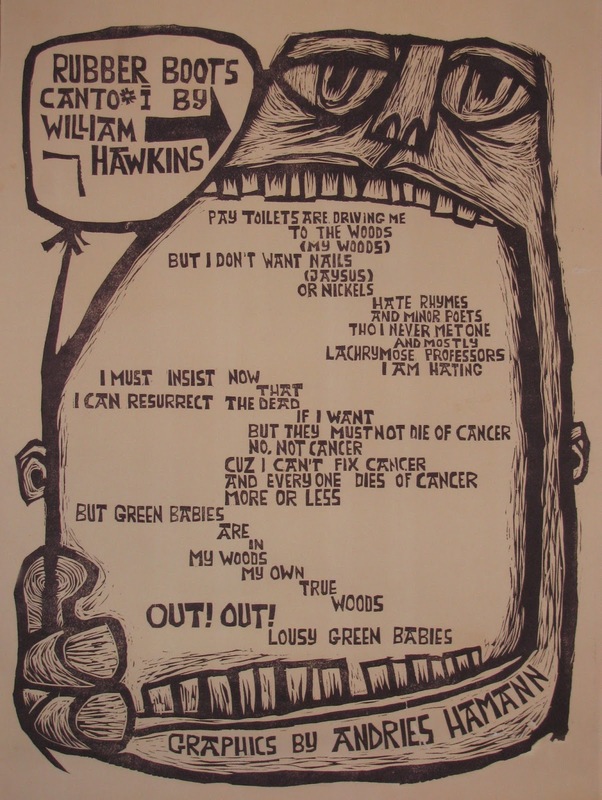 Hawkins’ exploits are as legendary as they are apocryphal, including tales of facilitating Jimi Hendrix’ recording of a Joni Mitchell performance at Le Hibou on his reel-to-reel (later recording Hawkins performing a new song on guitar at the after-party), a run-in with Mexican police at the Mexican-American border involving a pick-up truck of weed (and Trudeau’s subsequent interventions on their behalf), and a day-long reading at the site of a former hotel in Ottawa’s Lowertown [See my recent interview with Neil Flowers on the Northern Comfort anthology, an edited transcript of that reading, here]. Another story has Hawkins sitting on stage reading quietly to himself in a rocking chair during a performance of The Children at Maple Leaf Gardens, as they opened for The Lovin’ Spoonful. He hinted at a hardscrabble upbringing, including a stretch in a jouveile detention centre, for which he earned a small tattoo on his hand. Hawkins didn’t publish another book for thirty-one years, before I saw the publication of his second selected poems through my Cauldron Books series, Dancing Alone: Selected Poems (Fredericton NB: Broken Jaw Press, 2005) [See Roy MacSkimming’s introduction to the collection here]. A double album of the same name appeared a year later, including nearly two dozen covers of Hawkins’ songs by various friends and admirers, including Lynn Miles, Murray McLaughlin, Sandy Crawley, Ian Tamblyn, Suzie Vinnick, Neville Wells, Sneezy Waters, Bruce Cockburn and others, as well as a new song performed by Hawkins himself. Without Hawkins, Bruce Cockburn said, I never would have started writing songs. The writing, of course, stands up today. His poetic accomplishments were consolidated in the 2005 selected poems, Dancing Alone. However, the details of his publishing intersect with a broad cross section of people and events that made invaluable contributions to the development of Canadian Literature. Shoot Low Sheriff was published in the wake of the famous 1963 UBC conference where Allen Ginsberg, Robert Creeley, Charles Olson and others influenced the next generation of Canadian poets. Ottawa Poems was published by Nelson Ball’s now legendary Weed/Flower press. 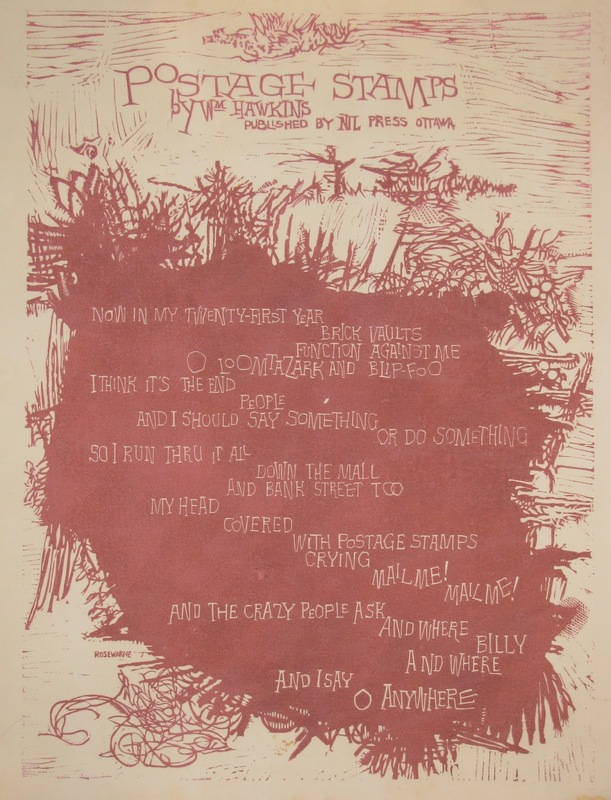 Hawkins’ inclusion in the Raymond Souster edited New Wave Canada not only saw him published by Contact Press, but also published alongside early work by Michael Ondaatje, bpNichol, Victor Coleman and Daphne Marlatt (then Daphne Buckle) among a long list of others. See Roy MacSkimming’s excellent introduction to Dancing Alone for further description, but these details of Hawkins’ publishing life are important. They place him in significant currents and developments in Canadian poetry. Yet, the specific details of this publishing activity have remained scattered. After Noel Evans put together the rough manuscript of Dancing Alone, it was I who pushed to get it into print. 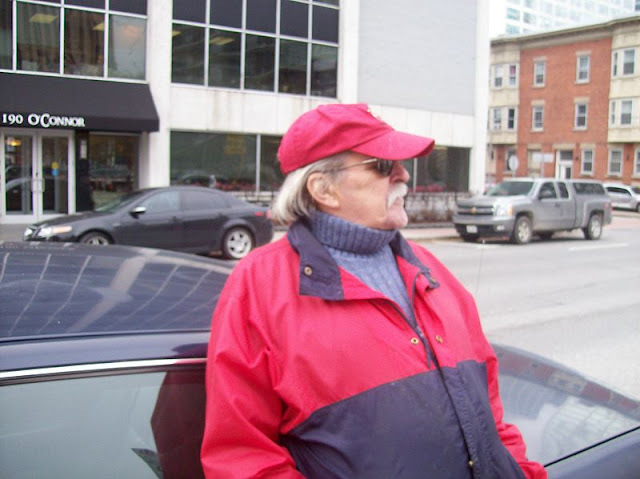 For years, he would show up at my doorstep (Rochester Street, Somerset Street and McLeod Streets) and call from his cellphone, requesting I come out to his car for a visit. “Hey, my boy!” was his usual greeting. 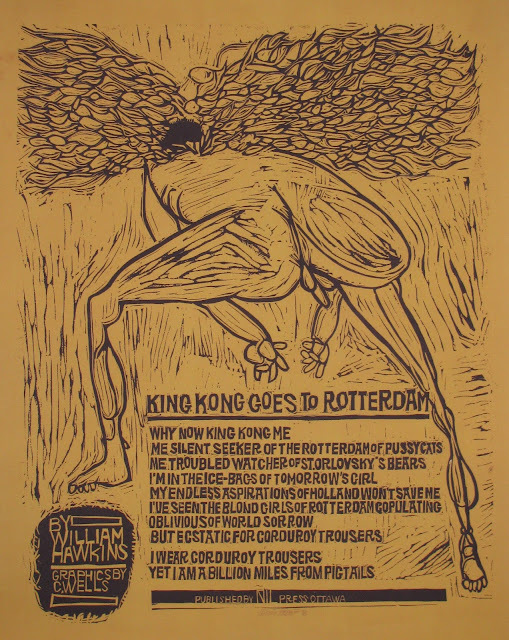 I could tell immediately that the publication of The Collected Poems of William Hawkins was exciting to him because, for the first time, he actually came into the house, oxygen tank and all. Part of what he liked about the book (despite considering the whole project suspect) was that he was finally able to dedicate a book to his mother. He once told me that our apartment building on McLeod Street housed a brothel in the 1970s. He knew the building from driving cabs, and driving the girls over. He had the wistful chuckle of someone who’d once been quite the troublemaker, enjoying the stories he knew were long behind him. We last spoke about two weeks ago, when Bill called to purchase more copies of the selected poems, and to complain about his latest hospital stay, which included having to get new blood. Ah, hell. Bill was a friend of mine. His energy was always positive and infectious, even if he hadn’t much. His performances were incredible, but, at least in his later years, took enough out of him that he required days to recover. When he read as part of his Hall of Honour ceremony, he held a room like I’ve rarely seen, before or since.